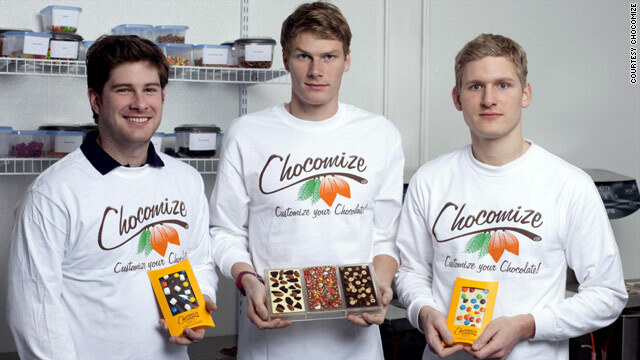 From left, Eric Heinbockel, Nick LaCava and Fabian Kaempfer incorporated Chocomize in August 2009. (CNN) -- The candy had melted in the backseat of the car, turning the dark chocolate, marshmallows, granola and Gummi Bears into a hot, sticky mess. But Nick LaCava wasn't having any of this "throw it away" nonsense. When he and his friends arrived home, LaCava, 23, tossed the bag into the fridge. A few hours later they dared him to eat it. "It actually was really delicious," LaCava said. "That was the moment that the lightbulb went off in our heads." The three friends -- LaCava, Eric Heinbockel and Fabian Kaempfer -- had just graduated from Columbia University. Heinbockel, 24, had left his low-paying job on Wall Street to move back home with his parents in New Jersey. LaCava, unable to find a good job in the financial world, was living with the Heinbockels as well. Kaempfer, 24, after looking at an equally bad job market in his native Germany, had returned to the States for a visit. They had been bouncing ideas around for their own company for months. "We all like chocolate and candy but Nick is kind of a candy addict. He has an incredible metabolism, so he can just sit there eating candy all day," Heinbockel said. He credits LaCava's sweet tooth as the inspiration for Chocomize. It was a simple concept -- a customized chocolate company where people could go online and create their own chocolate bars, combining ingredients like nuts, fruits, spices and candy with dark, milk or white chocolate. But going from brilliant idea to real-life company wasn't so simple, even for three ambitious young business grads. "Almost everyone seems to have a great idea that they think would work for a business," LaCava said. "The biggest challenge is actually forcing yourself to take the risk and get your business started ... you're facing the imaginary and that can be pretty daunting." The U.S. Small Business Administration was created to help entrepreneurs like the Chocomize men. The SBA's main job is to encourage people to make that jump, said Penny Pickett, associate administrator for entrepreneurial development. First up, Heinbockel said, was research, then writing a business plan. The business plan includes everything from an analysis of your company's competitors to the organization of its management to your financial projections. It's a guide for you to follow, Picket said, but it's also something to show potential backers that you're serious. "It's a blueprint for where you are and where you want to go," Pickett said. "You don't build a house without having a drawing in place." Writing the business plan forced them to think about a lot of different aspects they might have otherwise overlooked, Heinbockel said. The Chocomize men went to Google, looking for pricing on rent, machinery, packaging, website development and liability insurance. They sent a survey to everyone they could think of, asking what they would be willing to spend on chocolate and what ingredients they'd most like to be able to include. They even had responders vote on their company name. Kaempfer said the next step, getting financing, was the most difficult in Chocomize's start-up. According to the SBA, commercial banks are the largest lenders of debt capital to small businesses, but friends and family are also a huge resource to entrepreneurs. The partners thought they had a general idea of what they would need to start the company, but the things they hadn't thought of quickly added up -- like three $15,000 chocolate tempering machines instead of just one. So Kaempfer sold his car and the trio found more funding through family. Heinbockel's grandparents put up a significant chunk so that the men could maintain 100 percent ownership. The men moved at light-speed, trying to open Chocomize for the 2009 holiday season. They settled on a name, found an office, hired interns, found a production location and bought the necessary equipment. After their website launched in mid-November, orders started rolling in. In March, the company had its first profitable month -- a huge step for a new business, Pickett said. "We never expected the whole thing to take off that quickly," Kaempfer said. "I've thought about the whole thing -- if I had stayed in college to get my master's degree, I wouldn't have been any more qualified than I am now. You have to just do it and have to get started." LaCava agreed. He said he's working in a business he loves, with partners he respects, in a new industry that's teaching them something every day because they had the gall to believe they could. "If you never force yourself to take the first step, then a good idea will always just be a good idea," he said. "Being my own boss is great ... every time we have some sort of success, I know that it is because of the hard work and risk that we put into starting the company and keeping it going. Plus, being able to eat all the chocolate and candy I want without having someone yell at me is pretty awesome."